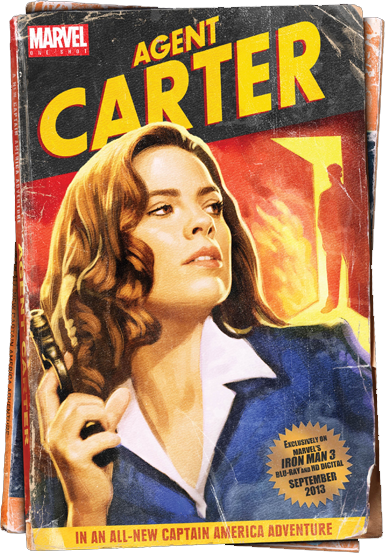 It feels like everyone has been joking about ABC pretending that this wasn't a sure thing for so long that it might've already happened, but no - it only just became official this evening: The Disney-owned network has given a direct-to-series order to Agent Carter, a Marvel-backed series starring Haley Atwell's character from the Captain America movies. The series, which is based partly on a "Marvel One-Shots" short film starring the title character, will be set in 1946 following the events of Captain America: The First Avenger. Though plot details are still being kept under wraps (the original pilot script came from the writers of Captain America: The Winter Soldier) it is assumed to follow the tone of the One-Shot, with Agent Peggy Carter battling both comic-book villainy and real world 40s sexism during the early days of S.H.I.E.L.D. Atwell has already been confirmed to return in the main role. Interest has been expressed (on both ends) regarding the return of characters like Dominic Cooper's Howard Stark and Neal McDonough's Dum-Dum Dugan, but no further announcements have been made. ABC has not confirmed a schedule position for the series, though there has been some speculation that it may begin as a "bridge series" between two half-seasons of Agents of S.H.I.E.L.D, which was also been renewed for a second season Thursday evening.